Help Me Choose My Christmas Eve Cast-on | Oh Sarah O ! With my Christmas gift knitting complete and Christmas Day just 4 days away, it's time for me to start thinking about what I want to start knitting on Christmas Eve and I need your help. Here's a list of my top 6 contenders. Let me know which one you think I need to make next. Sunset Highway by Caitlin Hunter This would be a swell sweater to have on my January vacay. I already have the yarn that I need, but it's a sock weight sweater so it may take awhile to finish. Wonder Woman Wrap by Carissa Browning What better way to ring in the new year than with a bit of girl power! This pattern was on my #2017MakeNine list and I purchased some yarn to knit this up at the Flock & Fiber Festival this fall. Breathing Space by Veera Valimaki This is another pattern from my #2017MakeNine list and I already have the pattern for it. I love the colors and the shape of it! Tartan Lula Loop by Wool and the Gang I purchased the yarn and pattern for this scarf several years ago and never knit it up. It would be lovely to have this to beat the winter chills. Sassy Santa Hat I got a random skein of Knitted Wit yarn at the Flock & Fiber Festival that vaguely resembles their Sassy Santa colorway, and it might be nice to have a festive cap to wear to work on Christmas Day. Salal cardigan by Andi Satterlund This is another #2017Make Nine list item. I started this cardigan during Andi Satterlund's Salal KAL but it knit up larger than I wanted and I frogged it and vowed to knit a smaller size at a later day. So, which one should I start on Christmas eve? Let me know in the comments below. 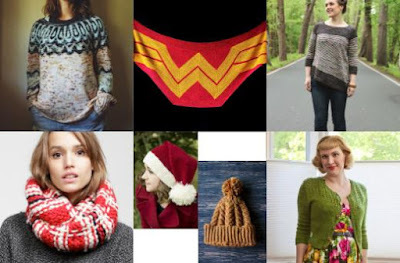 So far I have 1 vote for the Tartan scarf and a tie vote between the Santa hat and Wonder Woman Shawl. We're neck in neck folks! Now I have a vote for the Salal cardigan.